Choosing the right footwear for women may not be as easy as it sounds. Take kids, for example. A lot of parents measure their kid`s feet before buying a new pair of shoes. You think that paying attention to details stops when you reach adulthood and your feet stop growing. A lot of people have a hard time when it comes to finding that perfect fit. They find it hard to say "this pair of shoes fits me like a glove" because they are unaware of some factors that might contribute to them feeling uncomfortable while trying out different pairs of shoes. Why is that? Choosing the right shoe size isn`t enough. It is not about picking the color that matches your purse or picking a brand that is trendy. When choosing the right footwear you should take into consideration several aspects. As strangely as this may sound, a lot of women have one of their feet more developed than the other one. The difference in size is barely noticeable with the bare eye but women will sometimes feel that their right foot is not feeling as comfortable as their left foot. This is a clear indication that custom shoes are required. You are a woman who likes to follow the trends. That is nothing wrong with that but make sure to pick the shoes that make you feel comfortable. High heels can cause irreparable damage to your back and to the way you walk. This is why it is best to pick a medium sized heel for your shoes. You will also look good and the best thing is that you get to walk without feeling a throbbing pain in your legs. 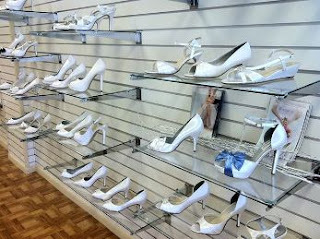 Picking shoes that aren`t fit for you can cause other problems, too such as having blisters, corns, hammertoes, bunions and calluses. A confident walk is something to be admired these days so make sure to choose what feels right for your feet. If you want to make your legs seem longer, you can pick a pair of ankle shoes. Depending on the style and brand of certain pairs of shoes, you can notice that some pairs won`t fit you, even if they are your size. The answer is simple: those shoes don`t fit because various brands have a different concept when it comes to shoe sizes. A lot of discrepancies will make you believe that you forgot your true shoe size. If you want to be one the safe side always ask the salesperson if he or she can measure your feet. This way the salesperson will know exactly what size you need. Before an intensive session of shopping for shoes make sure you relax. Each time you are stressed or you have walked a lot in the sun, your ankles and feet tend to swell and if you try out a pair of shoes in this condition you might end up not being able to wear them when your feet are relaxed, because the shoe size is one number high. Who would have thought that choosing the right footwear for women can be this tricky? Gipsy Dharma leather footwear is a rising leather footwear brand, which conveys with it a unique twist to the fashion industry. Their unique clothing and women s leather footwear is perfect for providing both comfort and style. You're right; it is tricky! I find that European shoes fit my feet better but I live in USA and most shoes here are made in China!